And I would probably answer, “I have no idea.” Blame it on all the paint fumes I’ve been inhaling, maybe? 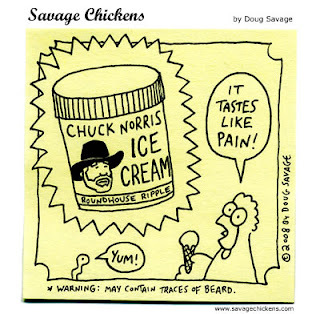 "Chuck Norris' tears will cure cancer. Too bad he's never cried." hilarious! my husband and i were on a long drive and we made up our own chuck norris facts for a good two hours. it was an excellent time killer for a car ride. And my favorite: Chuck Norris once counted to infinity, Twice.